Perhaps the most popular small fruits for the home garden, strawberries are also among the hardest to grow organically. Strawberries have many insect pests and diseases that damage plants and berries alike. Establishing your plants in well-drained, fertile soil and maintaining a weed-free patch are essential for success. You can choose among three kinds of strawberries, depending on when you want fruit. Consult your local extension office or nurseries for the best varieties for your area. June-bearing varieties produce one large crop of berries in late spring to early summer. Everbearing varieties produce two smaller crops: one in early summer and another in early fall. Day-neutral berries, the newest type, can produce fruit continuously throughout the growing season. 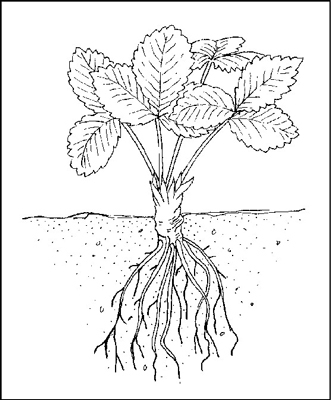 Plant dormant, bare-root strawberry plants 18 to 24 inches apart in 3- to 6-inch-high, 3- to 4-foot-wide raised beds. Set the plants so that soil covers the roots but the crown remains above the soil. Keep the soil moist but not saturated. Pinch off all flowers until midsummer for the first season to encourage strong root and top growth. Plant strawberry plants so that the crowns are just above the soil. The plants that you set out are called the mother plants. They send out runners that root and develop daughter plants in mid- to late summer. Space the daughter plants evenly around the mothers. Daughter plants flower and fruit the year after they grow. In the second summer, you can remove the mother plants to make room for new daughter plants. Plan to replace your strawberry planting every three to five years. Cover the planting with straw mulch after the ground freezes in cold-winter climates, and remove the mulch as the weather warms in spring. The tarnished plant bug can severely damage the developing fruit. These insects winter in plant debris and live on weeds in and around your yard. Covering the strawberry plants in the fall with a floating row cover can offer some protection in the following spring and early summer. Early-ripening varieties often suffer less damage than late-season berries. The strawberry clipper or bud weevil is another significant pest in some areas. These insects fly into the planting from neighboring woodlots and hedgerows about the time that the flower buds swell. Adults destroy the developing buds by laying eggs in them. Many other insects, slugs, mites, and nematodes attack strawberry fruits and plants, reducing vigor and production, and introducing disease. Birds and ground squirrels also take their share. Strawberries are subject to many fungal, bacterial, and viral diseases. Fungal infections include leaf spot, leaf scorch, leaf blight, powdery mildew, red stele, verticillium wilt, root rot, and several berry rots. Avoid planting strawberries where tomatoes, eggplants, or potatoes previously grew to prevent wilt diseases.